What is so appealing about largemouth bass fishing that it can put a smile on your face like the one on my Bass Bum® buddy, Mitch, at right? The sheer number of freshwater fishing lures they will strike due to their natural aggressiveness? The many different types of largemouth bass habitat where they can be found? The many tactics and presentations, both new and old, that can be utilized in our efforts to catch them? All of these things contribute to the appeal of our hunt for a trophy "bucketmouth". Fishing for largemouth bass is no less a hunt than is hunting deer, elk, bear or any "above water" wild game. It could be argued that hunting for and finding bass, then deciding what lure or lures to fish and how to "present" them so as to entice a strike, involves far more variables than hunting land game. 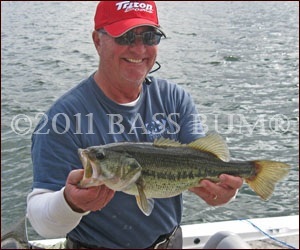 Research and preparation done prior to embarking on a largemouth bass fishing trip will increase your odds of success. What's the clarity of the water? Crystal clear, stained, cloudy or downright muddy? Are they feeding on shad, crawfish or other forage? Remember, match the hatch! What fishing tackle and lures do you use? That's the final question. The first group of factors listed above pertain primarily to research and preparation done prior to your first cast. They are discussed on a broader basis in other sections of this site. Here, we'll discuss their application specifically to "old bucketmouth", also known as the large mouth bass, big mouth bass or more correctly, the largemouth bass. The preceding are many, though not all, of the factors that influence your success as a bass fisherman on any given day. An assessment of each of these prior to and when fishing is prudent. Disregarding them entirely when largemouth bass fishing will not serve you well in your quest to catch them. It's all about preparation. Two quotes from men well considered to be "successful" in life attest to the value of preparation. "If I had six hours to chop down a tree, I'd spend the first hour sharpening the ax." "Before everything else, getting ready is the secret to success." Many say it's better to be lucky than good. I feel that better than lucky is being prepared, as preparation breeds luck. "Well she's got personality, walks with personality, talks with personality....". Some of you old guys out there will remember that song. Everybody has a personality, some good, some bad. Lakes, ponds and rivers do too! While a largemouth bass is a largemouth bass no matter where you find it, the water in which it is found is often quite different and presents a different set of largemouth bass facts that determine how you fish for them. You might say each has it's own personality. There are impoundments like the TVA reservoirs found in the South, mainly "highland" reservoirs. There are wide primary rivers that present mile after mile of shoreline and the bonus of current and natural lakes that are dominated by shallow water compared to many large impoundments. Don't overlook small waters like ponds for largemouth bass fishing. Each year more "big bass" are caught in small ponds and lakes than all other bodies of water. The personality of a water body is determined in large park on two dominant habitat features that draw largemouth bass, structure and cover. These include structure features like bottom composition, rocky outcroppings and change in depth. Included also are vegetation, timber, stumps, laydowns, docks, bridges, and brush. Learn a body of water's personality and you will be able to more quickly determine the location of the bass in it. What's this mean? More time fishing, less time "huntin for em". Man-Made Lakes Swampland Reservoirs result from daming a stream running through an area of low running terrain. They're fertile, not often deeper than 50' and often have a significant amount of flooded timber within them. They offer a healthy habitat for largemouth bass.Flatland Reservoirs have historically produced bigger largemouth bass than other reservoir types. They tend to be flat bottomed, with predominant depths of 30-60', fertile and with a substantial amount of grass, a largemouth magnet. Meccas for largemouth bass fishing.Hill-Land Reservoirs are found most often in hilly country as the name implies. They are characterized by a long, deep main channel, created after damming off a river, off which branch numerous creek arms. Fertile and full of plankton they are great habitat for shad and other baitfish, which supports large populations of largemouth bass and makes then prime territory for largemouth bass fishing.Canyon Reservoirs are found in our western states. They're deep, several hundred feet, long and narrow with multiple creek arms and their waters are cold, quite infertile and crystal clear. Eutrophic lakes, also originally ologotrophic lakes but which have "filled up" over the eons, are shallow and bowl shaped, usually have significant vegetation, high in nutrients, lower levels of dissolved oxygen and have soft, muddy bottoms. Largemouth bass, as do bluegill and shad, will thrive in these lakes but are subject to "die-offs" from oxygen depletion if subject to "freeze-over" or extreme summer heat. Ponds and Pits are surprisingly rich waters for largemouth bass fishing. There are some three million plus ponds in the U.S. with an estimated one thousand being built annually. Many, if properly managed, hold very large largemouth bass. Don't pass on a chance to fish one that is managed in a manner so there is a proper balance of largemouth and bluegill. Rivers and Streams are recognized primarily for current, which many largemouth bass anglers think is avoided by "old bucketmouth", since habitat stability is the core of their existence. However, most rivers and good sized creeks will offer, on a fairly consistent basis, constant water temperature, cover, structure and dissolved oxygen levels conducive to largemouth bass fishing. The bigger largemouth to be found will be true to their nature, "homebodies", and won't wander far from their "staked" territory. They will hang out near current where they can satisfy all their needs. Structure and cover are to big mouth bass what lying is to big mouth politicians. You may find cover or structure without any resident largemouth bass but you will rarely find bass that are not hanging close to them. They're cover oriented from birth and cover and/or structure provide them the concealment and security from predators they need. However, a house without water and electricity does not a comfortable home make. Same with bass. If it's too cold, too hot and/or there isn't enough dissolved oxygen present they will look elsewhere, no matter the quality of the cover or structure. Of equal importance when largemouth bass fishing is the presence of forage. If you're home, warm, in your favorite chair with a great football game on TV but you're hungry what do you do? Go find something to eat. Same with largemouth bass. Understand when largemouth bass fishing that bass don't stay in one place all the time. The changes of the seasons and the need for food trigger migration and temporary relocation. They'll move shallow to deep and visa versa in order to locate conditions suitable for spawning, fatten up on baitfish in open water or the back of creeks in fall or to deeper water where there is more oxygen in summer. 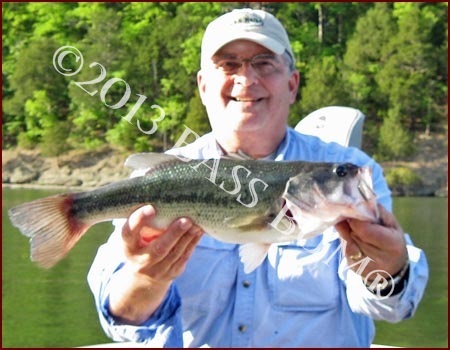 However, tracking studies have clearly demonstrated that largemouth bass are very much "homebodies". Unlike smallmouth bass, they will not "usually" move away from their original spawning grounds and home refuge by more than 300-500 yards. Migration during warm water periods can occur several times a day, in early morning hours, at mid-day and again in early evening. These movements are usually from deep to shallow water and can last as little as a few minutes to as much as a couple of hours. When cold water arrives, migrations will happen though no more than once, maybe twice a day, lasting no more than 15-30 minutes. Such movements must be kept in mind when largemouth bass fishing. Make sure the maps you choose have well defined depth contour lines and if you use a GPS device grab one of the GPS fishing maps now available from Atlantic Mapping, Inc.
Summer's increased water temperature will drive many largemouth bass to deeper water where they can be found on offshore structure. Fall largemouth bass fishing is almost as good, better in some ways, than that of spring. Largemouth will move back towards shallow water. Importantly, they are hungry and seeking to "pork up" for the long winter, unless they're in Florida or South Texas. So What Is The Lure That Is Specifically A largemouth Bass Lure?